One of the most intriguing fixture in 2016 European championship took place on Saturday afternoon as two neighbor countries Switzerland and Albania took on each other. Fabian Schaer had given Swiss side the lead early in first half and Albania day became even more difficult when Capain Cana was sent off for his second yellow card. However Albania hanged in there for most part but failed to get back on level terms with 10-men. 37′ [ 2 Yellow/red ] Lorik Cana was sent off for his second bookable offense leaving Albania playing with 10 men for rest of the 90 minutes. The game is set to take place at the Stade Bollaert-Delelis in Lens and its a massive game for both sides specially Switzerland who are widely expected to make it out from Group A alongside France with automatic qualification. Albania vs Switzerland will kickoff at around 03:00 p.m CET / 02:00 p.m uk time and BBC will have live coverage of the game from UK viewers. If you missed the live action you can always tune in here for full match extended coverage. 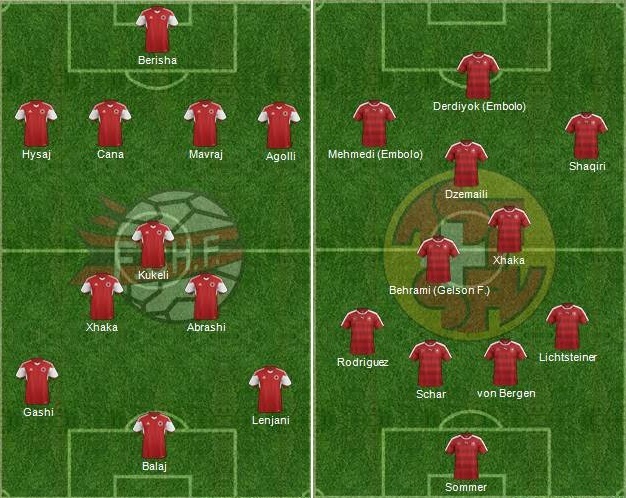 Team News & Possible Starting Lineups: Albania has to make a decision on whether to start with Taulant Xhaka as he is struggling with match fitness and will be assessed the on the day of the match. Switzerland on the other hand might have to take the field without Valon Behrami who is still struggling with niggles. Former premier league players Johan Djourou and Stoke City player Shaqiri will keep their places in starting lineup. Match Predictions; Switzerland are favourites going into the game looking at the qualifying rounds. Alabia has the worse goal scoring stats in qualifying round as they only scored 7 goals in 7 games. None of the Albania players has scored more than once while Switzerland has played Albania six time and ever failed to score. I expect a tight game but Swiss quality to break Albania in the end. Its a narrow 1-0 win for Switzerland as far as I am concerned. Albania to spring a surprise!